AdAge: I-Hsien’s second Dungeons & Dragons article about the Photoshop contest sponsored by Wizards of the Coast and Adobe. Eclipse Phase PDFs: Posthuman Studios co-founder Rob Boyle’s repository of free Eclipse Phase books. Patreon—Total Party Thrill: You’ve been asking for it, and it’s finally here! Help support new content and get some cool stuff. Plus, read Part 4 of Mourning Glory: The Annotated History of Brand Talandro. The All Guardsmen Party: A shoutout to Shoggy for inspiring the Brand series. Homestar Runner—Trogdor the Burninator: The “original” half-man, half-dragon. Mourning Glory: The Annotated History of Brand Talandro, Part I: The very polite initial interactions between I-Hsien and Shane that would become Inquisitor Brand, hosted by our friends at Tribality. Mourning Glory: The Annotated History of Brand Talandro, Part II: The continuation of I-Hsien and Shane’s conversations that would become Inquisitor Brand, hosted by our friends at Tribality. 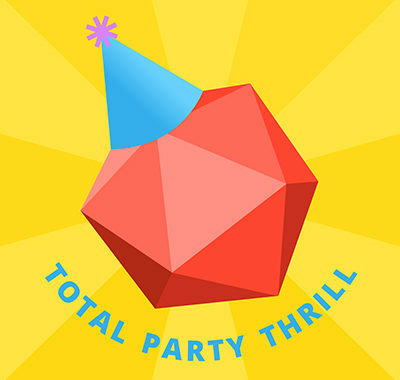 TPT #72: Playing Tieflings & The Faustian Fiddler: We discuss playing on of Planescape’s most iconic races, Tieflings. TPT #84 Playing Genasi & The Fistadin: We discuss playing Genasi, a less-iconic but no less-loved race integral to Planescape.